The AirJet XR Sample Cooler is designed to provide precision sample temperature control (–90°C to +100°C) for NMR, EPR, and X-ray diffraction instruments using a mechanically refrigerated, temperature-controlled air stream. 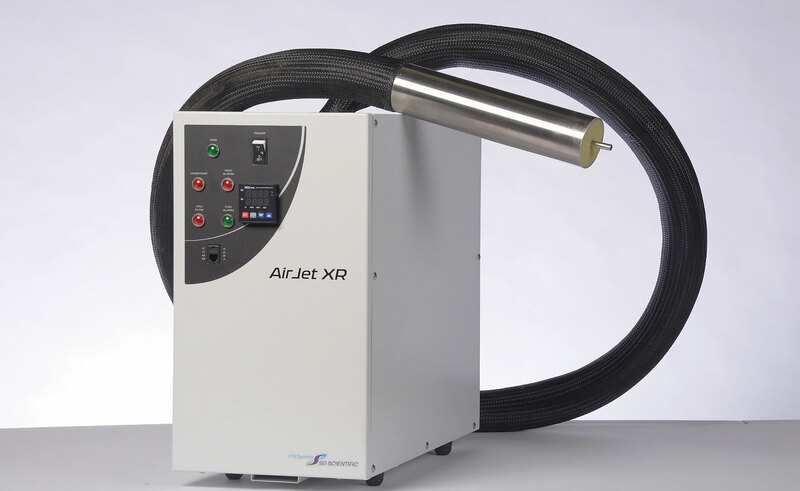 Unlike systems that use cryogens such as liquid nitrogen or carbon dioxide to control temperature, the AirJet XR requires only house-compressed air to control temperature. When dry air passes through the AirJet XR, it is cooled by the mechanical refrigeration system and heat input is precisely regulated to control the temperature of the air stream. This design approach creates outstanding temperature stability for instruments of just ±0.1°C, improving the accuracy and repeatability of your experiments. Long non-magnetic delivery lines allow positioning of the AirJet XR refrigeration system remotely from your sample area. Compact in design, it enables rapid transitions and precise control for flows up to 2 SCFM (56 lpm).